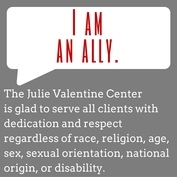 Julie Valentine Center has an ongoing need for the items below. These items are used in direct victim services for the child and adult clients seen at the center, the various hospitals we serve, as well for our ongoing support/parenting groups. Thank you for your continued support! If you or your company would like to hold a collection drive to benefit the Julie Valentine Center please complete the contact form below.